Taste the Love. Love the Taste. It may sound like an exaggeration but its not – every living Parsi on this planet will have tasted Ravo. 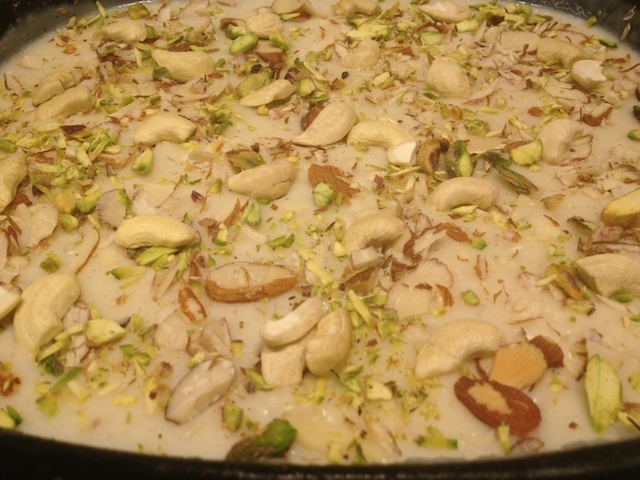 Made from fine semolina, this Parsi version of the Kheer is a dish that everyone is familiar with because of its synonymity with happy occasions. Just as background, Ravo is a dish made in every Parsi home on birthdays, navjotes, weddings, jashans and many other happy occasions. 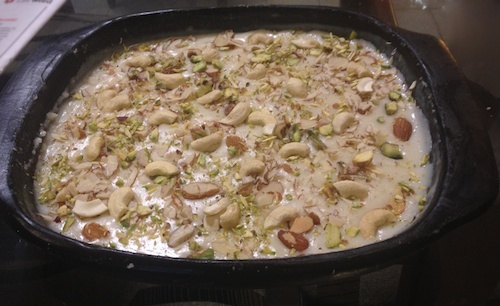 Some Parsis may argue with me and point out that the Parsi Sev (vermicelli based dessert) is a strong contender to the Ravo, but personally, give me a plate – or platter – of Ravo any day and I will be one happy Bawi. Like the Dhansak, every Parsi household will have its own version of the Ravo and based on the occasion this is one dessert that you can dress up or down really easily. For example, you can reduce some of the sugar and skip the dry fruits to have it just as a normal breakfast or you could go all out with raisins, pistachios, almonds and even some saffron or rose petals for those occasions when you have a special impression! Many of you already know but #BawaGroom and myself recently completed one year of wedded bliss. To celebrate, I woke up early, had a shower and made the hubby as well as the family some Ravo. I got the recipe from an old Katy Dalal cookbook where she stated that the quantities specified in the book would make enough for 50! To avoid giving the MIL and the maid the shock of their lives, I sat down with a calculator and have adapted this recipe for a family of six. Enjoy! 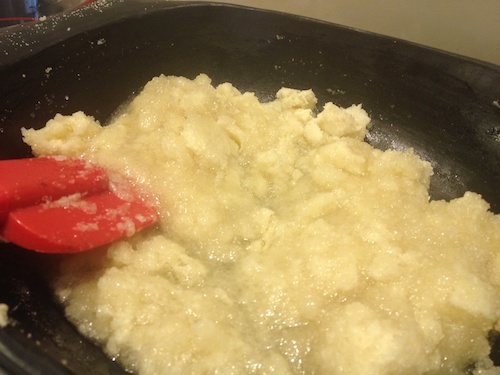 Taking a large non-stick saucepan, place the ghee and semolina and cook on a slow fire until the rava absorbs the ghee. Keep frying till it takes on a nice ivory colour. 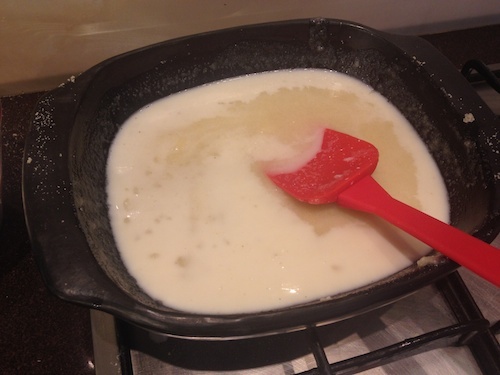 Then, add the water and sugar and keep stirring until all the sugar has melted and a thick mixture forms. Keep the gas on low and continue to stir. With the other hand, add in the milk in a slow trickle until all of it has been added. Raise the flame and keep stirring for another 10 minutes till a thick liquid forms. Once the milk has been soaked up, taste to check that it is cooked. Sprinkle in the nutmeg and cardamom and cook on slow for 3 – 5 minutes. As the ravo thickens, it has a tendency to form small granules. Stir these with the back of your spoon as the perfect Ravo must be smooth. 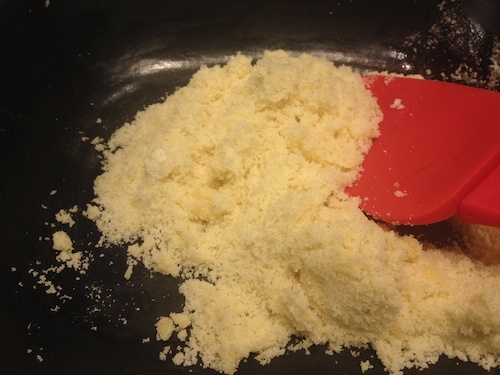 Once the Ravo is thick and sticky remove from the fire and mix in the vanilla essence. Empty the Ravo into the dishes you are going to be serving it in and let it cool. Meanwhile, in a small pan, heat some oil and quickly fry the charoli, pistachios, cashews, raisins and almonds – it will only take about a minute. I prefer to have my Ravo without the dry fruits being fried but frying them is the traditional way. Once the dry fruits are ready, simply garnish the Ravo with the dry fruits and Voila! This was my first time making Ravo and I must say that this recipe was a complete success! If your’s generally turns out not too sweet or too full of that ghee flavour – do give this recipe a try. To prove to you, how delicious it actually is, here is a picture of my lovely #BawaGroom enjoying his third serving of the Anniversary Ravo! Sign up to receive all my recipes directly to your inbox. We don't spam. Pinky Promise. An absolute favourite of mine! BB – i love the step-by-step pictorial! Keep up all your wonderful work! 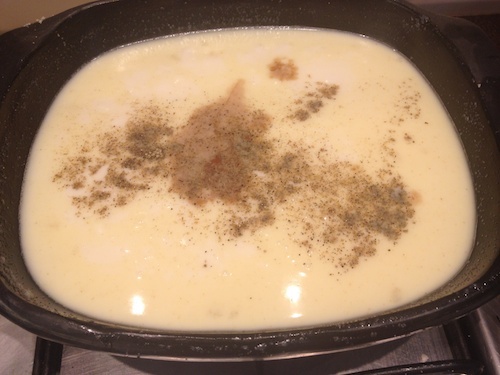 Thank you so much – do try out this recipe. It comes out absolutely fab! Perzen, we call this shiro in Gujarati. I sometimes make it extra rich by using cream. I add quite a bit of freshly ground nutmeg and saffron to it while it is cooking. I generally like to use butter (salted) instead of ghee. That imparts a very slight salty taste which is quite wonderful. 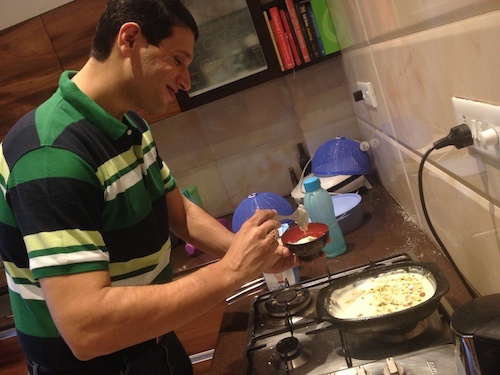 Also butter tends to taste better than Ghee with shiro. Please tell me where I can order the same? I totally love Ravo. RTI has it only on Tuesday’s. Would like to order and stock for a week. My nos is 9821227992. Please call, sums, whatsapp if you cater or where I can get it. Thanks for reaching out Karl. Have replied back to you over email. I love Ravo too and we serve it all days so do try us out. Get delicious Parsi food specials, news about our pop-ups and freshly cooked recipes delivered straight to your inbox once a week.